While we may love the idea of ascending Kilimanjaro, in recent years Africa’s tallest mountain peak has, let’s face it, became a little overexposed. Smooth gradients almost all the way to the top, and world-wide fame, attract climbers and hikers from around the globe, resulting in some trails becoming a little too crowded for comfort. Of course, Kilimanjaro remains the world’s best choice for those new to mountain ascents, or those without experience handling climbing gear, but what about the rest of Africa? Here is a look at the continent’s top 5 most thrilling peaks. Dramatic mountains any adventure travel enthusiast would love to climb, without the crowds and hype of Kilimanjaro. First climbed by the Duke of Abruzzi in 1906, Mount Stanley is comprised of two distinct peaks, Margherita and Alexandria, that reach up to an astounding elevation of 16,762 feet above sea level, making Mount Stanley the third highest mountain in Africa. Located in the jagged massif of the Ruwenzori Mountains on the border between Uganda and the Democratic Republic of Congo, the peak can be a little difficult to access, as the area is rife with political instability, but that’s all part of the travel adventure, right? Travel from Kampala takes around half a day, through winding country roads, before you finally reach Ibanda at the base of the mountain. When you get there you are likely to be astounded by the stunning vegetation surrounding Ibanda, with thick layers of spongy moss, forests of heather and gigantic swaying ferns accompanying your hike uphill. Yet the greenery soon gives way to jagged rock and thickly packed snow. Get out your ice axes, shoe spikes and helmets as you approach the toughest, near vertical, sections of the mountain. Note: Set aside the best part of a week to acclimatise and conquer Mount Stanley. Ethiopia is not usually thought of as a top class climbing destination, but anyone interested in adventure travel should check out this hilly inland country. The nation’s highest point is at the summit of Ras Dashen, a 14,928 peak surrounded by treacherous ravines. First climbed by Europeans in 1841, the higher portions of Ras Dashen are exceedingly dry and barren, though lower slopes are studded with palm trees. 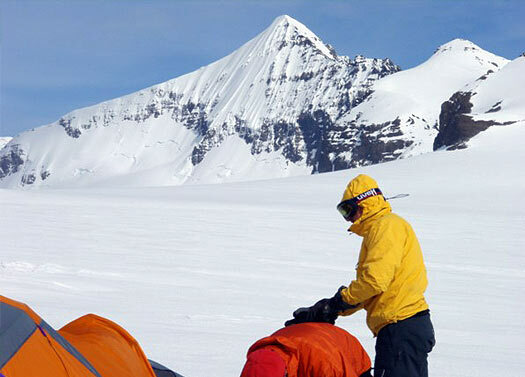 Much of the ascent here can be completed without needing to bring specialist equipment, although make sure you bring warm clothing, no matter how hot it is at sea level. 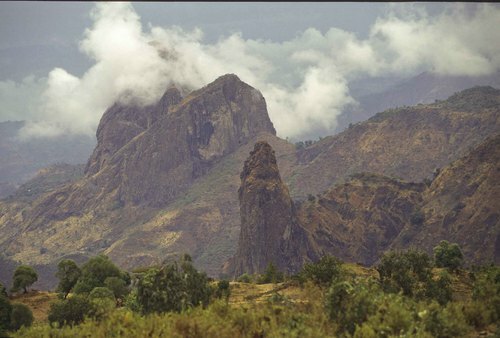 Views from the peak take in the stunning UNESCO World Heritage Site of the Simien Mountains National Park – awesome! 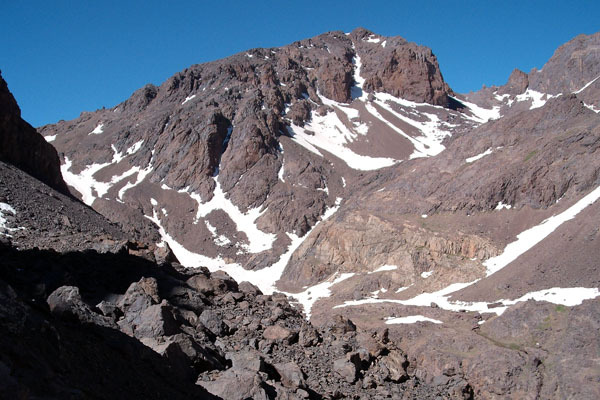 Towering some 13,415 ft above the Central Atlas Mountains of Morocco, Ouanoukrim is a real Jekyll and Hyde peak; snowy and freezing cold in the winter compared with punishingly hot in the summer. On your way to the summit mules and porters are on hand to carry any extra equipment you may want to bring, though camping sites tend to be well stocked and maintained. The slopes here are snowy and smooth enough for downhill skiing, so you might want to consider packing that snowboard before you set off. While South Africa is not home to the tallest mountains on the continent, it surely boasts some of the most picturesque, such as Mafadi, one of the highest peaks in the imperious Drakensberg range. Blanketed in a light dusting of snow in the winter months, in the summer it offers incredible views to verdurous canyons, incredible waterfalls and steep slopes, and is a fairly rigorous climb in itself. Perfect for an adventure travel holiday, Mafadi takes around four to five days to cover, from base to summit and back again. 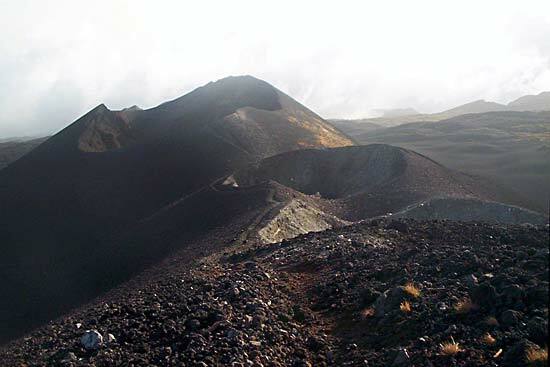 An active volcano reaching some 13,255 feet above sea level, Mount Cameroon is a must for travelers seeking to hike through some of the densest and most untouched rainforest in Africa. The mountain is a short distance away from the Atlantic Ocean, so receives plenty of rainfall, but on the plus side, you can be lying on beautiful golden sands just hours after completing your descent. The mountain is the most active volcano in West Africa, so check seismic reports before heading out! 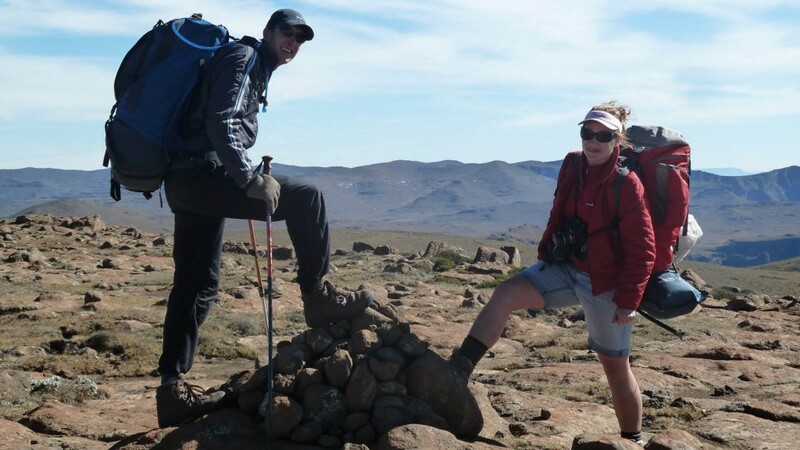 This guest article was written by Geoff – an avid traveller with a love for Africa and mountain climbing. This entry was posted in Africa, Land Sports, Rock Climbing, Travel and tagged Cameroon, Ethiopia, Mafadi, Morocco, Mount Cameroon, Mount Stanley, Mountain Climbing, Ouanoukrim, Ras Dashen, South Africa, Uganda. Bookmark the permalink.